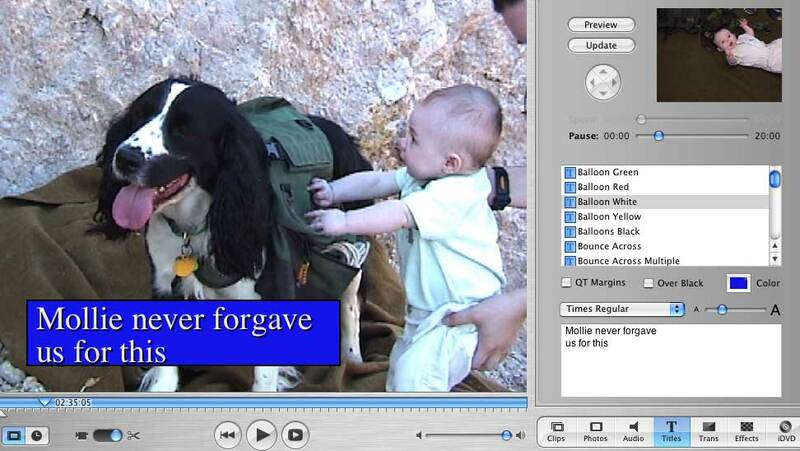 Using balloons, you can make balloons on your iMovies. This is similar, but not identical to VH-1's pop-up videos. 1. Select one of the balloon title options: black, white, red, green blue. This sets the color of the text. 2. Select the color of the background. Click the color picker. 3. Type in your text. If you want multiple lines, then hit return like you would expect. 4. Click on the preview pane to tell iMovie what should be the center of the balloon. 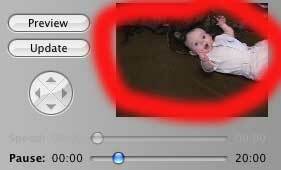 iMovie does not save the x, y position for transitions (it works for effects.) Thus, when you quit, it forgets the mouse location on the preview pane. This isn't a big deal unless you want to update a transition. If so, you will have to tell iMovie where the balloon goes. If you like the program and want to make a donation, please send $5.00 or whatever you think it is worth to me.